If you’re looking to add a unique twist to your holiday baking this year, you are going to love new Nestlé® Toll House® DelightFulls™ Filled Baking Morsels! 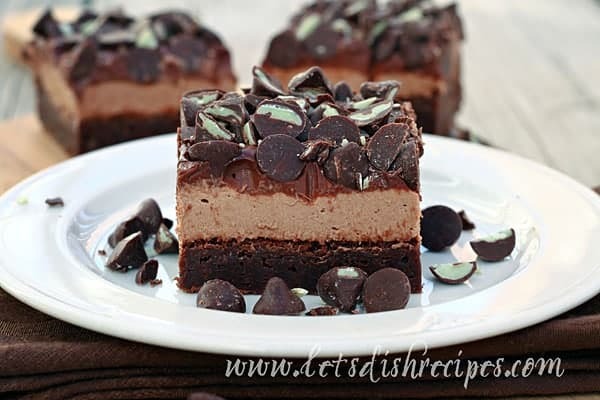 Because chocolate and mint is a classic holiday flavor combination, and one of my all-time favorite flavor duos, I decide to use the mint DelightFulls Filled Baking Morsels to create these decadent Chocolate Mint Mousse Brownies. 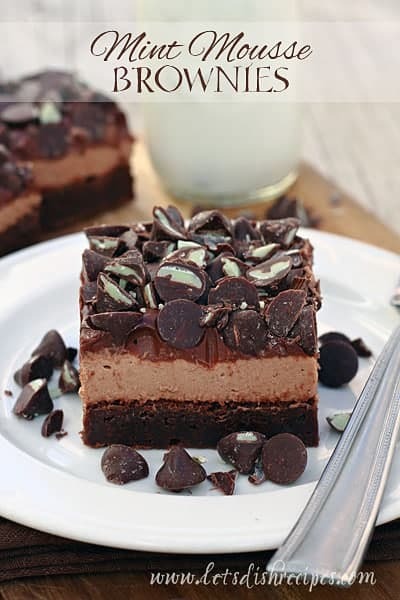 These heavenly mint chocolate bars feature a dense, gooey brownie topped with a light mint mousse and a layer of chocolate ganache. Chopped mint DelightFulls Filled Baking Morsels are sprinkled on top for some added color and even more mint flavor. These brownies will definitely be the talk of your next holiday party or gathering. You can bet they didn’t last long at my house! I admit, my family and I sampled our fair share of Nestlé Toll House DelightFulls during the baking process, and we all agreed that they’re pretty terrific straight out of the bag. I loved the mint and caramel varieties, my kids were huge fans of the peanut butter and chocolate combination, and my husband, whose favorite holiday treat is chocolate covered cherries, was partial to the cherry filled variety. Of course, during the holiday season there are so many reasons to bake, and DelightFulls Filled Baking Morsels are the perfect size for adding to so many holiday goodies, including your favorite brownies, bars, cookies, cakes and cheesecakes. I’m planning to bake up all four varieties in both classic and chocolate cookie dough, but the possibilities are endless! To see what I mean, check out all of the Nestlé Toll House DelightFulls recipes at the Very Best Baking website. I think these brownies would be pretty fantastic with any of the DelightFulls Filled Baking Morsels. 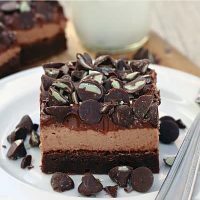 The mousse is pretty great as a stand alone dessert too, and you could easily create a peanut butter or cherry version by switching up the baking chips you use. I chopped some of the chips I used for garnish, just to highlight the contrasting colors inside, but you could leave them whole if you prefer. Whatever you choose to make, new Nestlé Toll House DelightFulls are sure to add a fun and tasty twist to your baking endeavors this holiday season! In a large bowl, combine flour, cocoa, and salt. Add butter mixture to flour mixture and stir until well blended. Spread brownie batter into prepared pan and bake for 25-30 minutes. Cool completely. Meanwhile, make the mousse by heating marshmallows, DelightFulls Mint Filled Baking Morsels and milk in a medium saucepan over medium-low heat, stirring often until completely smooth. Cool completely. With an electric mixer, beat whipping cream until stiff peaks form. Stir in cooled chocolate mixture. Spread mousse evenly over cooled brownies. Refrigerate until set. 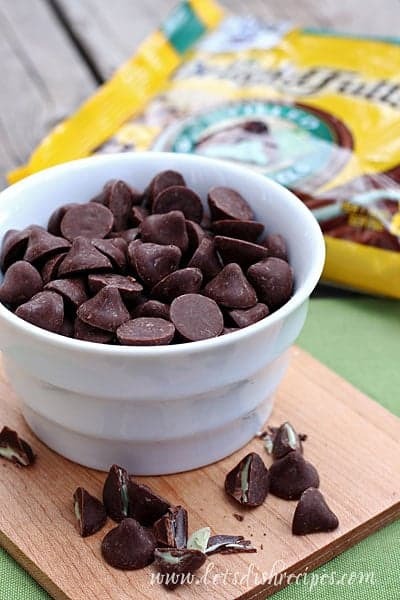 To prepare ganache, place 6 ounces Nestlé Toll House Semi-Sweet Chocolate Morsels in a medium bowl. Heat 1/2 cup cream in medium saucepan until just simmering. Pour over chocolate chips and let stand for a few minutes. Whisk until smooth and shiny. Let ganache stand until it is cool but still spreadable. 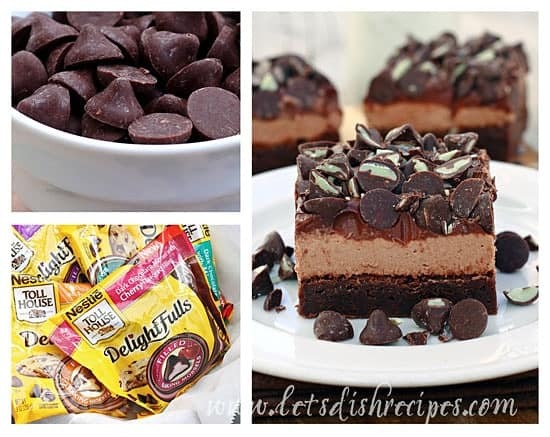 Coarsely chop 1/2 cup of the Nestlé Toll House DelightFulls Mint Filled Baking Morsels. Spread the cooled ganache carefully over the mint mousse layer. Sprinkle both the whole and the chopped mint morsels evenly over the ganache, pressing into the ganache slightly. Refrigerate brownies for at least 30 minutes, or until ready to serve. Keep leftover brownies in the refrigerator.